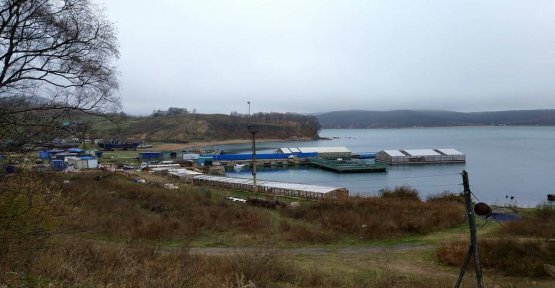 More than 100 sea be kept mammals according to the findings of animal rights activists in a Bay near the Russian city of Vladivostok captured. As the newspaper "Novaya Gazeta" reported, is eleven Orca - and 90-Beluga whales, which are cooped up in small pools. According to the head of the organization Sakhalin Environmental Watch Dmitry Lisitsyn, should be captured the animals for sale abroad. The environmentalists referred to as a "whale jail." "Animals are used, up to 100 kilometers per day, to be held in small cells caught," he said of the "Novaya Gazeta". recordings, the journalists were able to get with the help of a drone from the sealed-off pool, several enclosures, in each of which about ten white Beluga whales swimming. According to Lisitsyn, the whales were in the period between the 16. July and the 21. October of this year, captured. "Novaya Gazeta" are also information, that the animals should already be in the coming December, according to China exports. Animal Rights Watch Disturbing images: cattle bleeding alive and die in agony authorities, the operator of the "Wal-prison"
check Between 2013 and 2016 13 Orcas from Russia have been sold to China, writes the Russian newspaper. The total value of the transactions amounted to 700 million rubles, equivalent to approximately 9.2 million euros. The average price for a pet is at about 700,000 euros. In Russia, several companies animals export abroad: Sochi Dolphinarium LLC, Afalina LLC, the far East-Oceanarium and "White whale". These companies are also, apparently, the "whale jail" near Vladivostok. On Thursday, the Russian Supervisory authority announced that there are several violations of the animal husbandry laws were established. The four companies would not disinfect, among other things, the premises for the preparation of food and the containers for the storage of frozen fish products. Moreover, there are no plants to clean the water. Now, the authority shall consider why the company has been granted permission to catch the animals. "The fishing authorisation has been issued wrongly, we will challenge this decision in court and will get the right, I'm sure of it," said the head of the Greenpeace research Department of the "Novaya Gazeta". Greenpeace called on the Russian authorities to impose a ban on the export. Then the whales would have to be released.